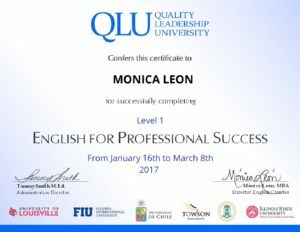 Congratulations to this month’s Certificate of the Month Winner, Maria Milagros Garcia, from Quality Leadership University in Panama City, Panama. Quality Leadership University is a Panamanian institution with a 20 year history of offering bachelors, masters, continuing education seminars and English Courses for professional success for teens and kids. Quality Leadership University regularly awards Certificate of Completion certificates to graduating students. After manually creating and printing hundreds of certificates, Maria decided to search online for a better certificate process. “Since we have discovered SimpleCert, we stopped wasting so much paper and reduced costs incredibly. We send around 600 certificates bimonthly and all our students are happy to have a certificate that they can send, upload or attach to any website they need to,” Maria says. Maria’s have been chosen as the Certificate of the Month for her effective use of logos and backdrop design. Incorporating two high-quality signature image files on her certificate helps to create a highly professional award. Thank you Maria for your continued support of SimpleCert, and for being an advocate for ways to improve SimpleCert! It is our pleasure, and our honor to work with you. And congratulations on being this month’s Certificate of the Month winner! If you would like your certificate to be considered for the Certificate of the Month program, send us an email to inquires@simplecert.net. Be sure to include your company URL and the title of the CertSet that you are nominating. Winners of the Certificate of the Month program will receive 250 credits, or one month’s free membership to their account!